Google has announced it will hang onto its established Hangouts chat service despite the upcoming arrival of Allo, leveraging both apps to reach audiences with capabilities that are not yet provided by Apple's competing iMessage. Google's existing messaging app, Hangouts, will continue to exist even after the launch of Allo, the search giant revealed in a statement to Business Insider this week. This despite the fact that part of Allo's user base, as well as its basic functionality, overlap with the well-established Hangouts service. Armed with both messaging clients, Google now hopes to reach new audiences— particularly the kind that use services like Facebook's WhatsApp, Allo's most similar competitor. While Allo will remain limited to iOS and Android, Hangouts will stand alone, continuing to be a more traditional chat client with distinguishing features, including desktop support for Mac, PC, and Google's own Chrome OS. Allo was announced by Google on Wednesday at the company's annual I/O conference, alongside a new video chat client dubbed Duo. Together, they will both compete with Apple's iMessage and FaceTime platforms when they launch on iOS and Android this summer. In a statement, Google said it will "continue to invest in Hangouts," suggesting the company has no plans to gradually sunset the legacy service. Google says its reasearch has found that people tend to use more than one messaging app, which it has used to justify keeping both Allo and Hangouts available as standalone products. 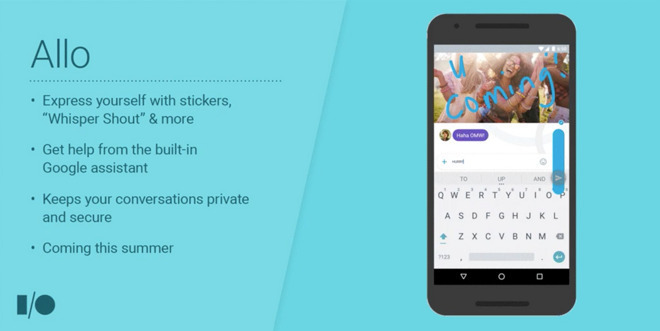 Both Hangouts and Allo offer instant messaging and sharing of photos, emojis and stickers. Hangouts, however, integrates with Google's For Work products that are geared towards business audiences, and it also works seamlessly with Gmail and Docs. Like WhatsApp, Hangouts and Allo will reach audiences on iOS and Android, while iMessage only serves Apple users. With iMessage alone, users cannot send multimedia content to users who are not on Apple hardware. With features for more expressive communication and font resizing, Allo provides a number of similar capabilities to Facebook's WhatsApp. Allo goes beyond, however, by integrating Google services to provide "smart replies" and encourages users to chat with its built-in Google AI assistant. Meanwhile, iMessage does not provide any of these features or search capabilities, and Apple thus far has shown little interest in competing more directly with the likes of WhatsApp.